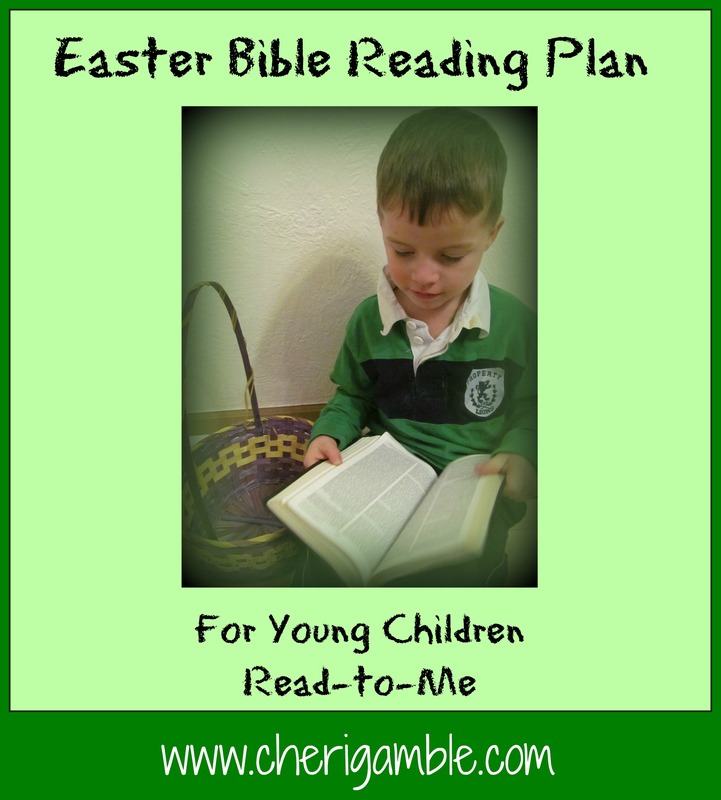 This is a Bible reading plan that is designed to involve your young children with all aspects of the Easter message. With your help, young children will become familiar with such events as Palm Sunday, the prayer in the garden, the betrayal, the trial, the death and the Resurrection of Jesus Christ. Suggested activities, crafts & videos are also included in the plan. 2016 NOTE: Starting this the week of Valentine’s Day (Feb. 14) will have you reading about the Resurrection the Monday-Friday before Easter and will have you reading about the Great Commission the Monday-Friday after Easter. If you have older children or teenagers, you can find their plan here. If you love the Bible reading plans but want even more for your family, check out the study I have put together called “The Feast: A 7-Week Easter Study for Families”. This study includes the entire Bible reading plan, plus much, much more. Every lesson begins with an appetizer (a way to introduce the reading for the day), continues on to a meal (the Scripture reading and discussion questions) and ends with a dessert (ideas for additional activities to drive the point home). In addition, there are cross curricular ideas for every single day — ideas for Language Arts, History/Geography, Science & Math, plus at least one outreach idea for each lesson. To find out more information, click on the picture. If you work with children or youth in a church or Christian school setting, you might be interested in my Easter plays for children. Each of these plays were written for use with the children I work with and have all been performed by those kids — a group of about 20 ranging in age from 4-14. We had fun with them . . . and the message was proclaimed to the congregation as well as retained by the kids. Maybe you can use them, too! Finally, I would be THRILLED if you would like my facebook page or follow this blog. 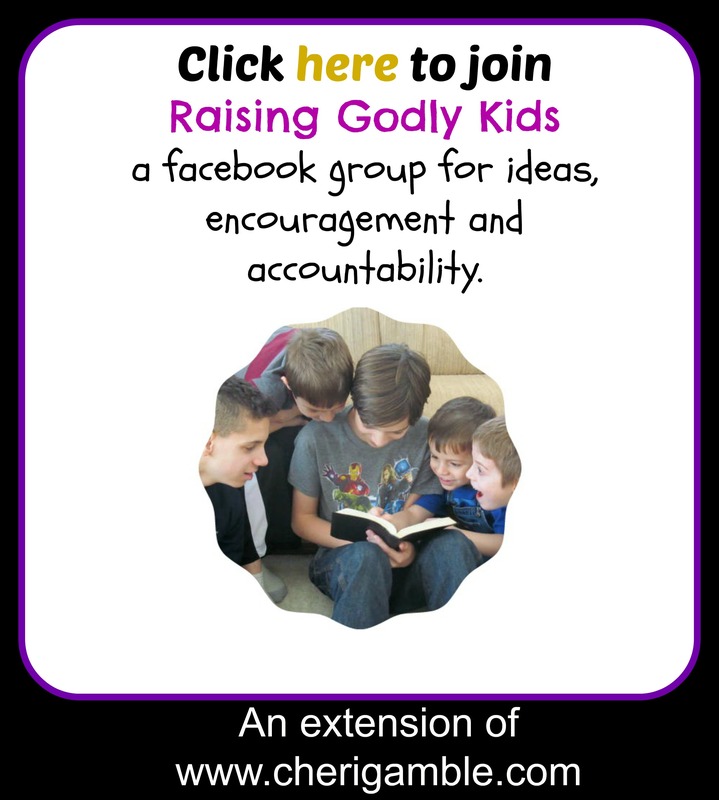 And, if you enjoy the Bible Reading Plan, please share this link with your friends. Let’s get EVERYONE reading the Bible with their children this Easter season! Keep scrolling for the printable plan, or find the entire plan right here on this page. May God Bless you and your family this Easter! Jesus said that whoever serves Him must follow Him! What does it mean to follow someone? It means you do exactly what they do. Play a game of follow the leader to get this point across. Then do a craft. Trace your child’s foot on a piece of cardboard paper. Then write ways that your child can follow Jesus on the foot. Let your child decorate it. You might also choose to trace several feet and write a different way to follow Jesus on each foot. Then put the feet on the ground in a path and “follow” the feet to follow Jesus! What did Jesus do after supper? Jesus washed His disciples feet! He showed them what it means to be a servant! What do you think it means to be a servant? How can YOU be a servant? Take turns washing each other’s feet today! Have a fun snack together . . . get some teddy grahams (or gummy bears or any other treat that you can use to represent people). Then get a bowl of pudding (or frosting or anything that you can pretend is water). Dip the teddy grahams “feet” in the “water” to represent Jesus washing the disciples feet. Jesus knew that one of his disciples was going to betray Him. What does it mean to betray someone? (Explain this concept to your child if you need to). It would be sad to know that one of your friends was going to hurt you, wouldn’t it? It would probably make me cry. Draw a teardrop on a piece of paper and let your child color it in to remind him that Jesus was sad. What happened to Jesus in these verses? What did Peter do when the soldiers came near? He drew his sword and ended up cutting off the ear of one of the soldiers – but what did Jesus do? Jesus HEALED it! Even though they were coming to arrest Him, Jesus still healed the man! Jesus is a powerful healer! Take a paper plate and have your child draw a face on it. Then cut out two “ears” from construction paper and tape them on the side of the plate. Let your child pretend to be Peter and “chop” off the ear, then pretend to be Jesus and heal it. Another option is to transform an old sock into Malchus and cut another old sock up to be the ears. Then put velcro strips on the socks so that the ears can attach and unattach easily. NOTE: If you want to read the verse where Jesus heals the soldier’s ear, see Luke 22:51. This is a Psalm that prophecies something that just happened to Jesus. What is it? Jesus was betrayed by a close friend, just like this verse says. Talk about what it means to be a good friend. Help your child make friendship necklace kits (or any other gift) to give out to his friends. Follow these instructions from Inner Child Fun. What did Peter do in these verses? Peter lied about knowing Jesus! He was afraid to stand up for Jesus! What happened when the rooster crowed? Make a rooster craft. How did Judas feel when he realized what was going to happen to Jesus? Judas felt really bad about what he had done. He was never able to forgive himself. His life was ruined. Do you remember how much money Judas got for betraying Jesus? Make 30 pieces of silver with your child. Cut circles out of cardboard (or old cereal boxes) and cover them with aluminum foil. Then let him act out Judas throwing the money at the chief priests. You can even have him use toys to act the scene out. Who did Jesus appear before in these verses? Jesus was now going to go on “trial”. He was appearing before different men to see if they thought He had done anything wrong. Let’s pretend to have a trial today. Make a judge’s gavel out of old toilet paper tubes or anything else you have around the house. Dress your child up to make him look like a judge. Have him use the gavel to pound it on the table. Let him pretend to be Pilate, or make up your own “court” case and let him have fun being a judge. What did the soldiers put on Jesus? Jesus was now wearing a crown of thorns. Make a crown of thorns snack today to remind you of the crown of thorns that Jesus wore. You can also make a crown of thorns using playdough and tooth picks. Discuss with your child how it must have hurt to wear a crown of thorns – but Jesus did it – for US! hand to the craft sticks to decorate the cross. Glue string or yarn on the back so you can hang it somewhere to remind you of what Jesus did for you. How did the two criminals that were crucified with Jesus react to Him? How did Jesus respond to the criminal who asked Him to remember him? Jesus forgave him, and I think we will see that man in heaven some day! Who did Jesus see when He looked down from the cross? What did He say about His mom? Even at the very end, Jesus was obeying the command to “honor your parents”. He was honoring His mom! Make a card for your mom and dad expressing your love for them. What amazing things happened in these verses? First, the veil of the temple was torn in two. (Take a piece of paper and tear it in two – let your child do this, too). Then there was an earthquake. (Act out an earthquake with your child.) Then many people who died came back to life and were seen all over the place. (Pretend to be dead people coming back to life.) Have even more fun with this by setting up some blocks and then causing an earthquake that makes them all fall over. Who took the body of Jesus? In this passage, we see two men who were secret followers of Jesus step forward and make their commitment public. God does not want us to be a secret follower of Jesus – He wants us to let everyone know that we love Him. He wants us to let our lights shine! Why did they make the grave secure? What were they afraid would happen? So now Jesus is in a tomb, the tomb is sealed, and the tomb is heavily guarded! Things seem impossible, don’t they? But remember, NOTHING is impossible with God! Find a rock and decorate it as a reminder that nothing is impossible with God. tomb? Yes, the chief priests PAID the soldiers to lie! We know that Jesus rose from the dead and that there is now an empty tomb. Have fun acting out these verses with your child! Jesus appeared to his disciples again – only Thomas was missing! How did Thomas respond when he heard that Jesus had been there? How did Thomas respond when he finally saw Jesus? Today, we need to have FAITH and believe in Jesus. Faith is believing in something even though you can’t see it. Fill two glasses half full of water. Dissolve three tablespoons of salt in one of the glasses. This is the glass that represents “faith”. Put one hard boiled egg in the glass with salt (faith) and the other in the glass without. The one in the glass with salt should float. When we have faith, we can do amazing things! Where did Jesus go? He went back to heaven where He is preparing a place for us! What do you think heaven is like? If it is nice outside, have your child use sidewalk chalk to draw his own picture of heaven. You can also have him draw out today’s verses on a piece of paper. Have him draw ground and sky. Then have him glue cotton balls in the sky for clouds and then have him draw Jesus going up into the clouds. This is great! Filled with ideas and laid out so well. I know this took some work! p.s. followed your blog and on Twitter too!! Glad to have found you!! Thanks! I pray this helps a lot of families draw closer to Jesus this Easter season! All I can say is WOW!! You have compiled quite a few amazing resources here!! Thanks!! You’re welcome . . . I pray it helps families draw closer to Jesus this Easter! Fun and sensible study! Great plan. Thanks for all the great ideas and reading plan!